The Machining Department produces the majority of in-house manufactured parts using a variety of precise tooling and computer-controlled machines. From raw materials such as tungsten, titanium, aluminum, and fiberglass block, our machining personnel create essential components used in our rotor blades. Our machinists also develop the computer programs required to create specific parts. Using computer-controlled machining ensures that every instance of every component is manufactured to exact specifications with closely controlled machine tolerances. Machining personnel also design and manufacture much of the tooling used around the VHA facility and assist the engineering team with rapid prototyping. These types of single-part projects require a high level of skill and ingenuity since programs are not already written for the parts. 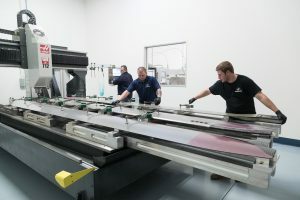 Most operations are completed with the use of our high-tech machines and equipment and involve trimming materials to fit specified drawings per certification by the FAA. From the water jet to the gantry mill, each machine provides a unique capability that allows VHA to produce our own parts and trim entire blade assemblies. The water jet uses a stream of extremely high pressure water to produce clean cuts through metal and other materials. At VHA, we use the water jet for such tasks as cutting root fittings out of raw stock and trimming abrasion strips. The VHA machine shop contains three HAAS computer numerically controlled (CNC) milling machines. Each HAAS is designated for a specific product line: one for trimming UH-1 tail rotor blade assemblies, one for trimming 206 tail rotor blade assemblies, and one for manufacturing 206 main and tail rotor blade components. The gantry mill features a 12-foot horizontal bed that allows large items like main rotor blades to be milled or trimmed. Up to three 206B main rotor blades can be loaded on the gantry mill at a time. The Mori Seiki horizontal machining center enables highly precise heavy duty cutting, such as trimming titanium parts. Titanium is an extremely difficult metal to machine, so having the Mori Seiki’s capability allows VHA to keep titanium machining in-house. Prior to being assembled, parts are placed through processing in order to eliminate residue left from the machining operations. After being processed parts are then placed into kits to indicated that all of the parts are accounted for and ready to be assembled by the Layup Department.